Based on the hit film and the incredible true story that inspired it, the high-flying musical Catch Me If You Can follows the life of Frank W. Abagnale Jr., who uses charm, imagination and millions of dollars in forged checks to create his ideal future. Abagnale successfully poses as a pilot, a doctor and a lawyer -- and wins the girl of his dreams -- before a dogged FBI agent finally catches up to him. Nominated for four Tony awards, including Best Musical, this delightfully entertaining show was created by a Tony Award-winning dream team, with a book by Terrence McNally (The Full Monty, Ragtime) and a swinging score by Marc Shaiman and Scott Wittman (Hairspray). The Musical Theatre West production takes off at the Carpenter Performing Arts Center in Long Beach. "...While certainly not a perfect show, CATCH ME IF YOU CAN in its stage incarnation can be an enjoyable night of theater, especially if you just simply buy into its machination that it is first introduced as a presentation by its lead character in the format of a 60's variety television program, but then forgive it a bit when it suddenly abandons that framework and turns into a traditionally structured book musical every so often. It's not a huge dealbreaker and it really shouldn't be." 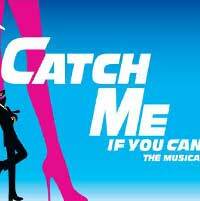 "...Teen con artist Frank Abagnale, Jr. is once again scamming his way across the country—but this time he’s doing it “Live In Living Color”—in Musical Theatre West’s pizzazzy spring offering Catch Me If You Can, the big-stage musical adaptation of Steven Spielberg’s popular 2002 biopic."